"We've had SMAART for about ten years. They are very cost effective and always there when you need them." "Working with SMAART Medical Systems for the past few years has been great. We purchased our first PACS system from them and have been very pleased. Their technical support is the best and I would recommend a SMAART-PACS to anyone." Interoperability: Is your PACS interfaced with your EMR and Radiologist? 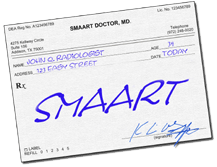 Serious About Saving Money in Radiology? UPGRADE to a SMAART-PACS Today! Don’t lose money by waiting another minute. SMAART’s low-cost, full-featured systems are just what the doctor ordered for tight budgets and busy staff. Over the last fifteen years, SMAART specifically developed its products for the needs of Critical Access Hospitals, Specialty Hospitals, multi-provider clinics and teleradiology practices. We found their number one need was to save money while improving care, so we developed the most cost-effective PACS system on the market today. We have saved healthcare facilities just like yours 40%, 50% even 60% over the cost of their legacy “brand name” PACS systems. Before you renew your PACS service agreement or buy a new PACS, talk to one of our experts about the SMAART solution. Your budget will be glad you did. SMAART-PACS is full of features that will streamline your workflow! Fingerprint login, 3rd generation teleradiology, tools for non-compliant modalities, interoperability technology, carefree off-site exam backup, management reports, virus resistance, report distribution, speech recognition dictation, advanced Internet security and advanced human factors just to name some. You will find your workflow easier and quicker from performing the exam to delivering the results. While SMAART features are great, your staff will like SMAART support even better! SMAART’s all US staff are just a phone call away, 24 hours a day, 365 days a year. There are no telephone screeners and no long queues. When you call you will get someone who can immediately speak your language and solve your problem. With SMAART’s unique support tools, the support technician will be able look at your computer screen to guide your staff, step-by-step through the solution. SMAART’s support tools also makes training new radiology staff simple and efficient. ©2019 SMAART Medical Systems, Inc. All Rights Reserved.